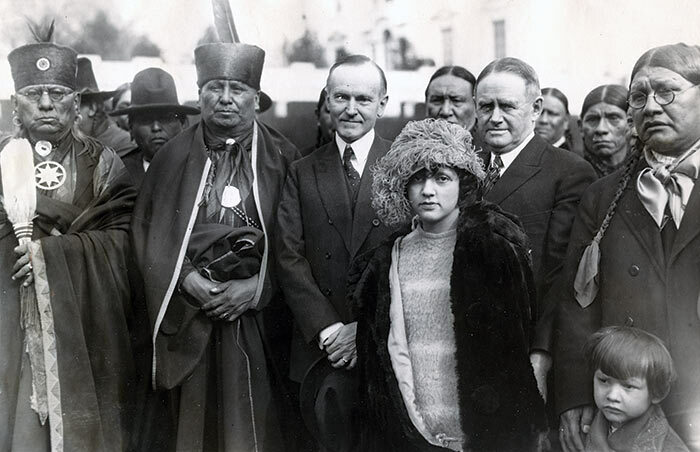 The delegation of Osage Indians, in the Capital seeking additional allowances from their government held incomes from oil lands, call at the White House and pose with President Coolidge. Unfortunately the caption does not identify any of the Osages in the photograph. We wonder if the man on the far left is not Chief Bacon Rind (see previous posts: http://www.dammingtheosage.com/osage-chief-bacon-rind/#comment-196 ). We welcome confirmation of that guess or any identification of others in the photo. Note the peace medals the two Osage men wear. Genuine medals today are quite valuable, but there are a lot of copies. The otter skin ‘bandeaus’ they wear are characteristic Osage head wear.